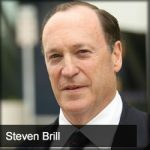 Jason Hartman talks with Steven Brill, founder of Court TV and co-ceo of the new company News Guard, about how we as a society can combat the massive influx of fake news. We all know that it’s a problem, but figuring out which site is actually providing us with accurate information is incredibly overloading. Then Jason and Steven discuss his book Tailspin: The People and Forces Behind America’s Fifty-Year Fall – and Those Fighting to Reverse It, and how some of the things that originally appeared good for our society have swung back around and ended up hurting the American people. [1:27] How does News Guard combat the problem of “fake news”? [15:03] What can be done about the lobbying discrepancies between the haves and the have nots?